In short, these are what jeans are supposed to be but in shorts form: durable, comfortable, clean. These fit even if you're not a slim-legged hipster who hangs his trousers halfway down, and there definitely is no stone washing or ready made holes! Then there's the price too. 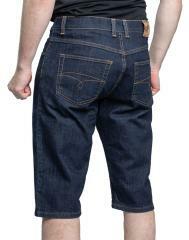 These are good quality jeans shorts, made in Finland/Estonia. These don't need to cost hundreds of euros. These have what is nowadays called high waist, which is not high at all if you're seen military surplus. The waist ends just below navel and the leg reaches down to the knee with most people (you can roll it too). Zipper fly and six belt loops - the loops are large enough for wide belts too. If it's not "slim fit", it's made of some pre-washed or pre-torn crap. Not the case with these! These are a rarity, actually looking like a pair of new jeans shorts with the nice dark blue shade. The only treatment these have had is the removal of starch, and that's it. This means they're also pre-shrunk, so you don't have to worry about that either. The fabric is 98 % cotton, 2 % elastane (or 98.7/1.3 but this makes little difference), these are very comfortable and pretty hard wearing. Material weight 11,5 oz. The metal parts on these are nickel-free. 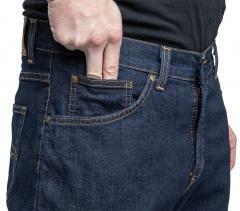 Sizes in normal jeans sizes, but with no different lengths, the leg is 36 cm from the crotch on every size. 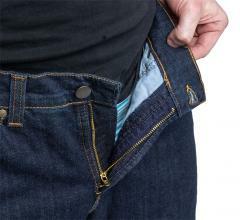 If you already know your jeans size, it's very probable the same is the best with these too. The subcontractor is the Finnish company MASI - the paperwork & finishing washes are done here, while the sewing work itself is made just over the gulf in Estonia. Erinomaiset shortsit. Istuu niin helevetin hyvin, että tulevaisuudessa tilaan farkkunikin täältä. Istuu jalkaan kuin hansikas käteen. Tohtisiko vielä toivoa mustana värivaihtoehtona niin olis äärimmäisen passelit. Erinomaiset fakkushortist, olleet käytössä kaksi kesää, enkä ole löytänyt mitään valittamista. Shortseissa ei näy kahden vuoden, melko aktiivisen käytön jälkeen, kulumisen merkkejä eikä värikään ole (ainakaan huomattavasti) haalistunut. Elastaaniakin on just sopivasti, ei kinaa missään vaiheessa mistään. Kaiken kaikkiaan siis loistotuote, ostais jo!